I’m a big fan of tapenade. As you can see from here. 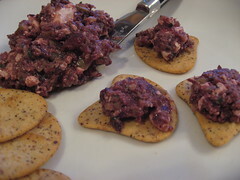 Following is another variation on the traditional tapenade. I think olives and feta are a natural combination and work great together. They both remind me of Greece, even though they are found in many other cultures and types of cuisines. The white flecks of feta are a nice contrast to the dark color of the olives. In a food processor fitted with the steel blade pulse the garlic a few times to thoroughly mince. Add both types of olives and capers and pulse a few times more until very roughly chopped. Add the olive oil, lemon juice, thyme and oregano and process until just combined but still chunky. If you have a whole block of feta, cut feta into small cubes. Add feta to the food processor and pulse a few times more. You want to still be able to see small chucks of the feta in the tapenade. Serve with crackers or toasted baguette. Makes a large party potion. *If your market has an olive bar, check to see if it has a Mixed Olive with Feta Salad. Use ¾ pound of the olive feta salad (very heavy on the feta and heavy on the green olives) in place of the ¼ pound green olives and 8 ounces feta. Any oil that comes along with the olive feta salad, use with the extra-virgin olive oil in the tapenade. I recommend cutting each olive in half before adding them to the food processor to check for missed olive pits. I find one or two pits about every time I buy olives. Also, see the crostini blog post that goes excellently with tapenade.